Although Propeller Nebula (Simeis 57, incorrectly DWB 111) is quite famous target for astrophotographers due to its spectacular appearance, we actually know very little about it. It was catalogued first in the 50s by astronomers working in the Simeiz Observatory located in Ukraine, as the 57th object in a catalogue containing 306 HII regions. 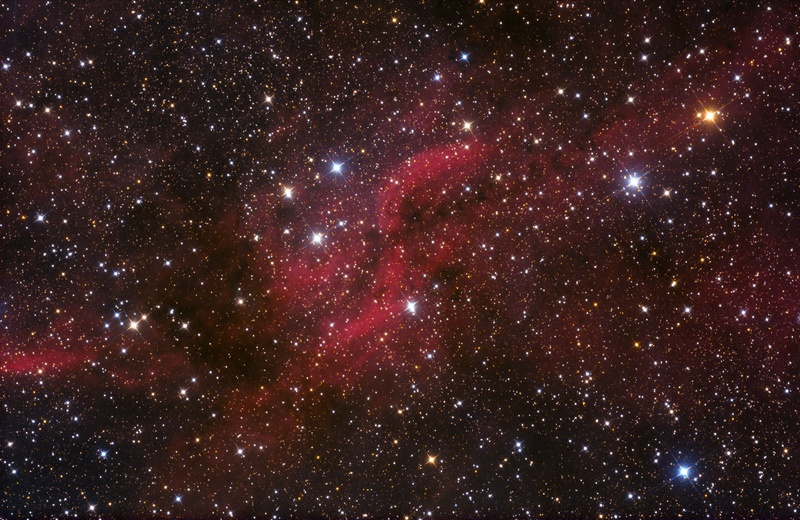 The Propeller Nebula is often incorrectly referred as DWB 111, however DWB 111 identifies the propeller's southern arm, while the northern one is DWB 119. DWB catalogue containing 109 emission nebulae related to the Cygnus X star forming region was edited and published by three astronomers H. R. Dickel, H. Wendker and J. H. Bieritz in 1969. The Propeller Nebula is located close to Gamma Cygni in the direction of north-east. Like many emission nebulae in Cygnus, the Propeller is part of the giant molecular cloud, the Cygnus X, which is about 4600 light-years apart from the Solar System. There is another, much more closer dark molecular cloud between it and us, in a distance of about 300 light-years, called the Cygnus Rift, which makes its observation much more difficult. Cygnus Rift can be observed by the naked eye under dark skies: it is the dark strip dividing the Milky Way into two parts, spanning from Cygnus to Sagittarius. The enormous quantity of dust and plasma contained by Cygnus Rift absorbs the most of the light coming from stars and other objects behind it. Unfortunately we know quite little about the Propeller Nebula, even its distance is undetermined yet. It mostly emits at the line of hydrogen-alpha, while it is much dimmer on other wavelengths. The stars or other sources responsible for the ionisation of the gas is also still to be identified. The mass of the cloud is less than 50 Solar masses, according to estimations.